Charles Ross & Son Company now offers a multi-agitator VersaMix specially engineered to produce shear-sensitive creams and lotions. After initial charging, the mix cycle begins by raising the vessel to meet the agitators. 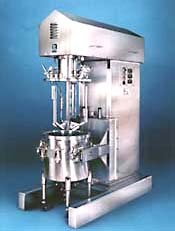 This raised-vessel configuration allows the stationary vacuum hood to be fitted with rigid piping for charging materials during the niix cycle. The low-shear agitation system is comprised of a two-wing baffle and an anchor agitator. Teflon(r) scrapers mounted on the anchor remove material from the vessel wall with each revolution, create vigorous axial and radial flow, and promote efficient heat transfer. A probe continuously monitors internal temperature, which is controlled with jacketing on the vessel and a separate heat transfer system. The vessel is also fitted with a cone-shaped bottom to ensure thorough discharge. After discharge the interchangeable vessel can be wheeled away for cleaning and charging, while a new vessel is wheeled into place to begin the next cycle without delay. The new Sanitary VersaMix is available in a choice of sizes from 2 gallons to 3000 gallons for sale or in-plant trial/rental. Many options are also available, including variable speed drives and a complete control package.